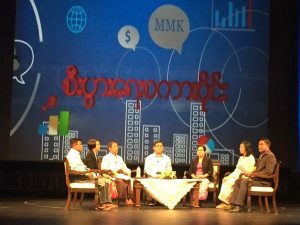 A Business Talk titled the Role Of Capital Market for Economic Development in Myanmar was held in Nay Pyi Taw on 1st October 2018. Panel discussion was led by Chairman of Securities and Exchange Commission of Myanmar and Deputy Minister for Planning and Finance, H.E. U Maung Maung Win, Members of the Securities and Exchange Commission of Myanmar, U Htay Chun and Daw Tin May Oo, Director of Yangon Stock Exchange, U Win Naing Oo, Executive Director of Myanmar Securities Exchange Centre Co.,ltd, Daw Yin Myat Min and, Executive Director of TMH Telecom Public Company Ltd , Dr Nan lei Yee Soe and participated in the discussion .